Orthography. The system of rules regulating the written and printed representation of the sounds of a language, the spelling of words, and punctuation. The basis of modern Ukrainian orthography is phonemic and morphemic, although some historical forms unrelated to its phonemic or morphemic structure have been retained. The first orthography in Ukraine was the Cyrillic Old Church Slavonic CS features such as nasal vowel letters (Ѫ and Ѧ instead of u and ja), the absence of intervocal iotization (eg, dobraa, -roe, ruu ‘good’), the etymological spelling of Greek words (eg, ahhlъ instead of janhol ‘angel’), and under Serbian influence the use of -ь instead of -ъ (eg, vѢkь, aminь ‘age, amen’). The reform was disseminated by Bulgarian, Serbian, and Byzantine monks, monasteries in Bukovyna and Moldavia, and even Metropolitan Cyprian of Kyiv. Different chanceries from the 14th to 18th centuries introduced their own orthographic peculiarities. The orthographic norms in Meletii Smotrytsky's Slavonic grammar (1619) had a determining impact on the printing of chronicles. His rules (eg, on using e or ie, o or ω, y or i, kh or g) were retained with certain modifications in the 1648 and 1721 Moscow editions of his grammar and are observed in Church Slavonic (CS) church books to this day. Reinforced by Russian etymological norms based on the 1708 hrazhdanka alphabet this historical orthography influenced the use and theoretical justification of etymological orthography in Ukraine (eg, the maksymovychivka script, which was widely used in 19th-century Galicia, and the pankevychivka script, which dominated in interwar Transcarpathia). Etymological orthography was imprecise (ie, it did not draw a clear line between the vernacular and CS, Old Ukrainian, and Russian) and difficult to master; hence, several attempts, based on the Serbian example, were made to devise a Ukrainian phonetic orthography. 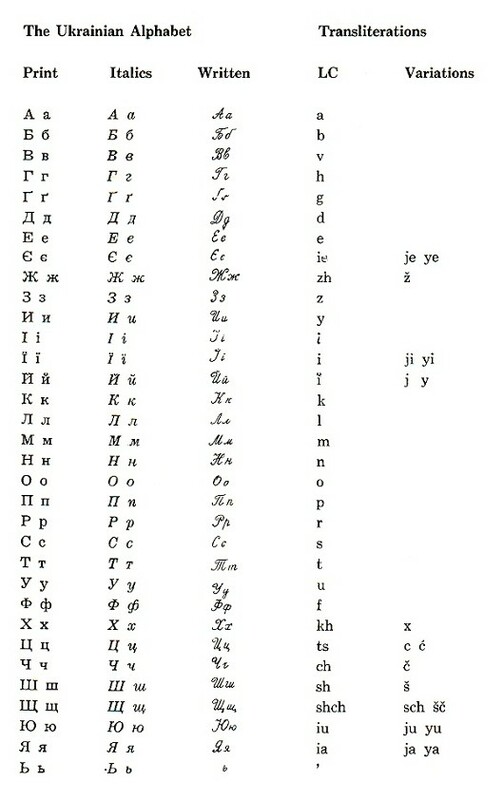 They included Oleksii Pavlovsky's grammar (1818); Panteleimon Kulish's kulishivka script, which was used in populist publications in the 1860s and 1870s; Mykhailo Drahomanov's drahomanivka script, used in his émigré publications from 1877 and by his Galician supporters; and Yevhen Zhelekhivsky's zhelekhivka script, used officially in Galicia from 1893. The struggle for a phonetic orthography was linked to the demand for a new vernacular-based (not an archaic book-based) literary language and had important political implications. In the 1880s the kulishivka script was banned in Russian-ruled Ukraine, and a modified version of the Russian alphabet, the yaryzhka alphabet, was imposed on Ukrainians. During the liberal period 1905–14 most Ukrainian publications in this territory adopted the kulishivka script. It was only after the February Revolution of 1917 that the second tsarist ban (1914) on the kulishivka was lifted, and a modern Ukrainian orthography was developed, based on it, the zhelekhivka script, and Yevhen Zhelekhivsky's and Borys Hrinchenko's dictionaries. Since 1918 many orthographic dictionaries and handbooks have been published (see Lexicography). In January 1919 the Orthographic Commission of the Ministry of Education of the Ukrainian National Republic introduced official orthographic rules. Under Soviet rule, similar rules were confirmed by the All-Ukrainian Academy of Sciences (VUAN) in 1920 and the People's Commissariat of Education in 1921. In 1925 a State Commission for the Regulation of Orthography was created. The commission's proposals and the orthographic differences that existed between Soviet (formerly Russian-ruled) Ukraine and Western (formerly Austrian-ruled) Ukraine were debated and resolved at an All-Ukrainian Orthographic Conference held from 26 May to 6 June 1927 in Kharkiv. The new, standardized orthography was adopted in September 1928 by the Council of People's Commissars, in 1929 by the Shevchenko Scientific Society in Lviv, and subsequently by Ukrainians outside Ukraine. By 1930, however, the Stalinist regime began to modify this orthography. It restricted the use of g and l’, and in 1933 it banned entirely the use of g, l’o, lja, and lju in foreign names and loanwords. It introduced etymological spelling forms (eg, -ia- instead of -ija-) to align Ukrainian orthography with the Russian. The new, so-called Kyiv orthography (published in 1936 and revised in 1945 and again in 1960) was not accepted by most Ukrainians in interwar Western Ukraine or in the West. In 1987 an Orthographic Commission was created at the Institute of Linguistics of the Academy of Sciences of the Ukrainian SSR to prepare a new, more contemporary official orthography. The 1990 orthography once again restored the letter g in a restricted number of words. In Austrian-ruled Western Ukraine, attempts in the 19th century to introduce a Ukrainian orthography based on the Polish Latin alphabet by Polonophile circles in Podilia and Volhynia and Polish governing circles (see Alphabet war) did not succeed. The Latin alphabet was used only by semiliterate peasants in Galicia, Podlachia, and the Kholm region and in popular publications for them. The Latin alphabet in printed Ukrainian was imposed by the governments of Romania (in Bukovyna, Bessarabia, and Dobrudja), Hungary (in Transcarpathia to 1918), and Slovakia (in church publications in the Prešov region from the 1920s) and was widespread at one time among certain groups of immigrants from these regions in the United States.